Born and raised in the Eastern Cape, Jessica Mbangeni is one of South Africa’s most sought after female Imbongi (praise singer), and has made her mark in male dominated cultural terrain. Invoking the role of this ancient tradition, largely influenced by her grandmother’s isiXhosa storytelling in the village of Nqamakwe, she offers insightful commentary on contemporary affairs. 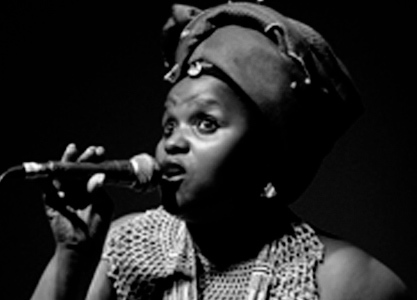 She has performed alongside numerous musical icons, such as Dolly Rathebe and Dorothy Masuka.